My Tampa Bay Mommy : *HOT* 4 Build-A-Bear $25 Gift Cards For $69 Shipped! *HOT* 4 Build-A-Bear $25 Gift Cards For $69 Shipped! 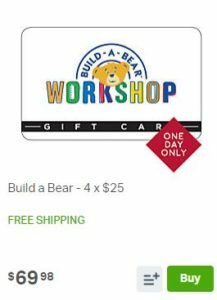 If you're a Build-A-Bear Fan hurry over to Sams Club online because right now you can get (4) $25 Build-A-Bear gift cards for $69 Shipped! This is a great deal if you want to use it for yourself or give as 4 gifts during the holiday season! View the Sam's Club One Day Sales Event HERE.